AS work to build the new Maghull North Station heads into its next phase, key Liverpool City Region partners visited site, on Friday, 24 November 2017, to see the progress being made on site. Liverpool City Region Metro Mayor Steve Rotheram, Sefton Central MP Bill Esterson and other representatives from the key delivery partners involved in developing the scheme joined Merseytravel and Network Rail, at the Station compound, just off School Lane in Maghull. Since work began, in September 2017, engineers have been hard at work preparing the site for the construction phase of the works, while enabling services to operate on the Ormskirk line as normal. 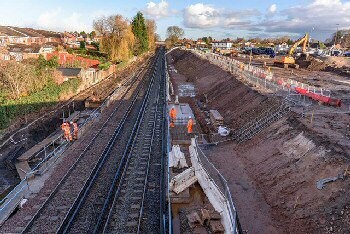 Extensive excavation and grading works have already been completed on the embankments to accommodate the new Station platforms and significant progress has been made installing the platform foundations. 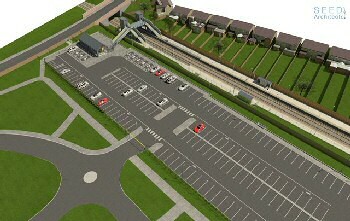 Groundworks have also been completed in preparation for the new 156 space car park alongside the new Station. Forthcoming works planned to take place overnight on Saturdays will involve realigning both tracks to ensure the lines are level and spaced correctly in line with the new platforms. After the festive period, from 27 December 2017 to 8 January 2018, the line will be closed to enable engineers to install the new platforms, the new footbridge to the platforms and associated staircases, lift shafts, and new track drainage. During this time, there will be a rail replacement bus service in operation between Maghull and Ormskirk. The new Maghull North Station will be located just off School Lane next to the former Ashworth Hospital site, between the existing Maghull and Town Green Stations on the Ormskirk branch of Merseyrail's Northern Line. ► Staffed Station building and ticket office with passenger toilet. ► Passenger waiting facilities on the platforms. ► Step free access with lifts and a bridge to, from and between both platforms and the Station building. ► 156 space car park with blue badge and motorcycle parking facilities, as well as cycle storage. ► Pedestrian and cycle routes from School Lane and Park Lane to the Station, and bus stops on School Lane. ► Future provision for electric vehicle charging points. The ₤13m scheme is being funded through the Government's Local Growth Fund (LGF), Merseytravel and the Homes and Communities Association, which previously owned the land on which the Station will be built. While Network Rail is building the Station, it forms part of the wider ₤340m investment of rail improvements across the Liverpool City Region, over the next 3 years. The new Station, which will be operated by Merseyrail, is expected to be open to the public, in May 2018. More details on the scheme can be found on the Merseytravel website. You can find out more about the wider investment across the Liverpool City Region at KeepLiverpoolMoving.Com. Steve Rotheram, Liverpool City Region Metro Mayor said:- "It was great to visit the Maghull North development today and see the fantastic progress that has been made in such a short period of time. This much needed new Station will greatly benefit the people of Maghull, as the Town continues to grow in the years ahead. I am really looking forward to visiting the site again when the Station opens next year." Bill Esterson, MP for Sefton Central added:- "The new Station will make a big difference to people in North Maghull and Lydiate, with the extra parking also a help to the rest of Maghull as well. This investment in Maghull is also important because of the new homes which are being built and will help commuters, students and shoppers alike. I am pleased that Merseytravel and Network Rail are talking to nearby residents about the building works as it is important to keep them notified of upcoming works. Once the Station is open, I hope that the benefits will outweigh the inconvenience during construction. This Station has been talked about for over 30 years and I am pleased that Metro Mayor Steve Rotheram, the Combined Liverpool City Region Authority, Sefton Council, Merseytravel and Network Rail have worked together to make sure it is finally being built for the many in Maghull and Lydiate." Cllr Liam Robinson, Chair of Merseytravel said:- "The Maghull North Station scheme is a prime example of our Long Term Rail Strategy being put into practice area and it's great to see how much has been achieved on the site in such a short space of time. The new Station will be of huge benefit to local residents, giving more travel options while playing a big part in helping the on going development of Maghull in the coming years." 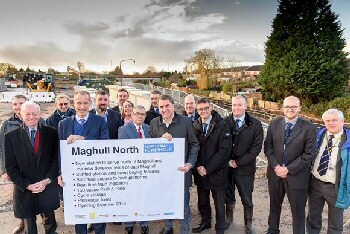 Martin Frobisher, Network Rail's London North Western route managing director, said:- "Fantastic progress is being made on the new Maghull North Station, which is an important part of the ₤340m investment in the Liverpool City Region. Improved rail links are vital to boost connectivity and improve capacity within the City Region and beyond, getting more people to work, education, services and leisure opportunities more quickly and easily. Much of our work has been completed at night when trains are not running to prepare for the new platforms, Station and car park. Our 12 day upgrade after the festive period will be vital to install key elements of the new Station including the new steel footbridge and lifts." Cllr John Fairclough, Sefton Council's Cabinet Member Locality Services, added:- "This project is a very important piece of infrastructure promoting public transport in Maghull and the wider Liverpool City Region. It's fantastic to see progress being made and moving on to the next stage with completion planned for 2018. Once finished, the new Station will provide some of the key infrastructure needed to support our Local Plan and will also complement other transport schemes like the improvements to Junction 1, on the M58 and the A59, making Sefton even more accessible to everyone." Andy Heath, Merseyrail's deputy managing director, said:- "With more and more people coming to live in the area and further house building planned, improved access to a local rail network is great news for the community, will ease congestion on the roads and help get people from A to B quickly and conveniently. We look forward to working with all the agents involved in this exciting project, ahead of the Station opening in 2018."